Received Wikki Stix from the nice people in Think Thank, and had some fun with Jazz. These interesting sticky wikki stix are flexible, as in you can really bend them in any way you like. They adhere to almost any smooth surface, are safe, non-toxic and allergy free. The only challenge is how to get creative with them. Mother and daughter are really lacking creativity, what I could think of, with the number of stix given, was to create Jazz's name. It's also a good time to get her familiar with letters writing. She sure knows how to spell her name well, but hmm, not writing them yet. I gave aid by writing the letters on paper, and she used the stix to curve her name out. What I've simply achieved from this activity was reminding her that writing and reading always begins from left to right and highlighting the directions and strokes of writing each letter. She did it simply well. I love the way she flexes and squeezes the stix to fit the letters. That was also when I realised I did the upper case and switched to the lower case unknowingly! What was I thinking. These stix are reusable, simple peel them gently to correct an err or change your idea! I left the letters as they were, thought the mixed cases looked rather 'creative'. Bad learning demonstration though. The stix are also light, portable and easy to carry around. Definitely great craft to keep kids occupied on the go. 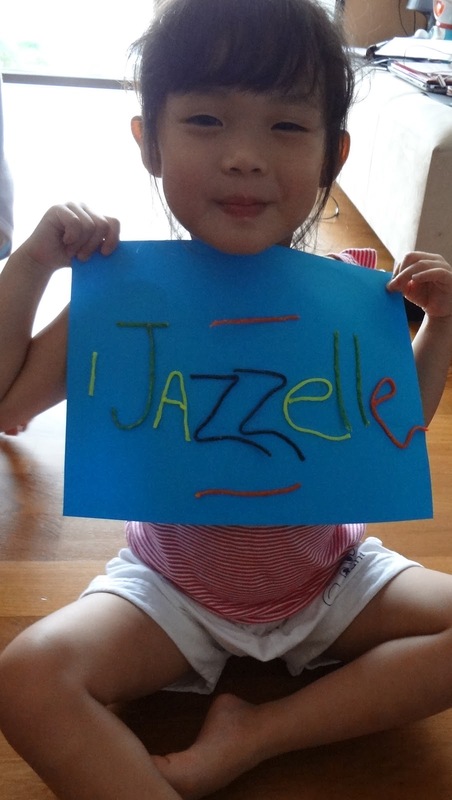 She completed her name with some remaining stix as embellishments. Oh, one thing for note, it's definitely not a good idea to cut the stix, they are made of acrylic hand-knitting yarn and a food-grade, microcrystalline wax, which made my scissors sticky and difficult to wash. So well, that sets the rule of the game, bend and flex as it is. These stix are made in USA. Locally, you can purchase online at: wikkistix. Disclaimer: Product was sponsored for review, all opinions are solely our own.